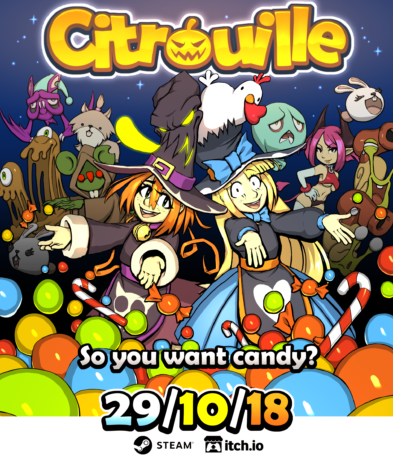 Citrouille will be released on the 29th of October. There’s going to be a 20% discount during the first week. Do you deserve candy? We just signed a contract with Plug In Digital to distribute Citrouille! Thanks to their expertise, we will be able to reach more platforms and players than we could have by ourselves. Unfortunately, that means we have to delay the release of the game. No new date has been set yet. We’re going to use this extra time to address the feedbacks we received. We are currently working on a better tutorial and a world selection menu. We’re confident this will make the experience better for our players. Details shall follow shortly. Citrouille has a trailer! This is still a first draft as some information are missing, but it’s pretty close to final.